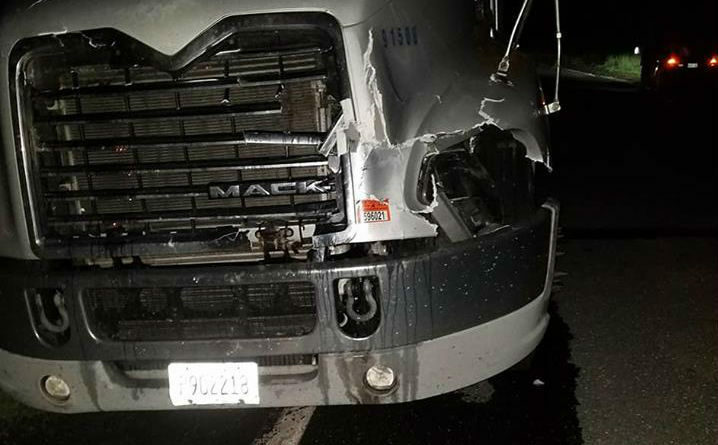 A moose ran in front of this tractor-trailer July 1 on Route 1 in Grand Isle, causing damage to the front end of the semi-truck. The moose was killed. VAN BUREN, Maine — Moose-related accidents are on the rise in the St. John Valley, with at least seven reported to police in the last two weeks. As a result, state and local officials are urging drivers to be more vigilant. Police said they have dealt with an excessive number of moose-related accidents on Route 1 in a 10-day period. On the stretch between Van Buren and Grand Isle alone, there have been six, with a seventh reported in Madawaska. Luckily, officials said, no drivers or passengers reported serious injuries. “We haven’t needed any ambulances this year, we’ve been very lucky about that,” said Officer Nathan Chisholm of the Van Buren Police Department. The Bangor Daily News is pleased to feature content from our sister website, Fiddlehead Focus. To read the rest of “More drivers hitting moose in St. John Valley,” an article by Fiddlehead Focus staff writer Morgan Mitchell, please follow this link to the Fiddlehead Focus online.